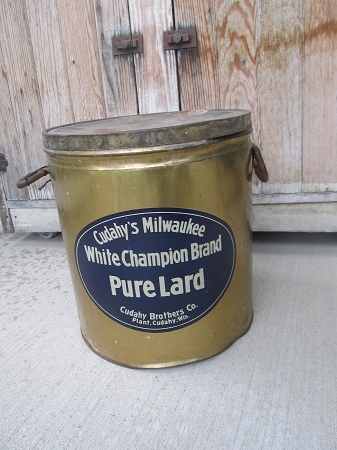 Antique Primitive Cudahy's Milwaukee Pure Lard Tin Canister. This is a fantastic piece of primitive decor. I saw lard tins featured in the January 2018 issue of Country Sampler Magazine as a hot collectible this year. This one has a great look, I love the graphics and just by spinning the can around, it changes looks! 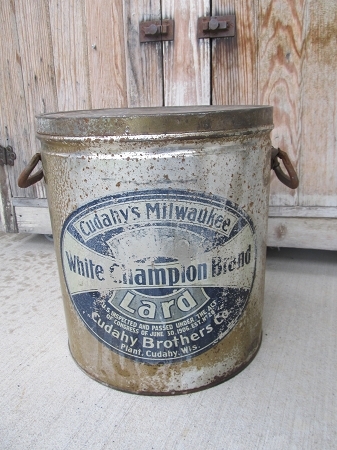 The markings all read: Cudahy's Milwaukee White Champion Brand Pure Lard. Cudahy Brothers Co. Plant, Cudahy Wisconsin. Also has Johnson Morse Can Co. Wheeling W Va. Love the handles on the side too. Nice large display piece. Great paper canister for display in your kitchen. Lid comes off, so you could decorate the inside or use for storage even. Size is 13 1/2" tall x 12 1/2" diameter.